Tait Enterprises worked with the business owners of Always Efficient Heating and Cooling, Inc. to define and develop a marketing and branding strategy that built on some logo ideas the client brought to the table. As a start-up business focusing on providing heating and cooling services to southeastern Michigan, Google Analytics has been included on the website to allow for insight into city-level interest by viewing geographic visitor trends. 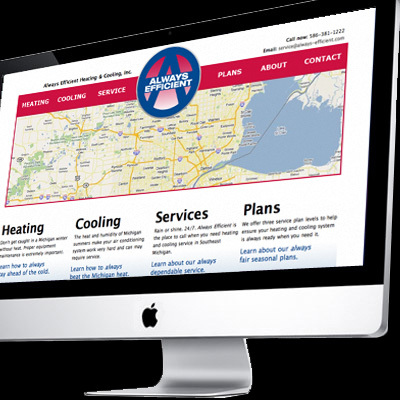 The current website was designed, developed and deployed in a few weeks to tie into several print advertising campaigns and the start of the fall heating season in Michigan. Check back for more portoflio examples in the weeks ahead. © Copyright 1999 - 2018. Tait Enterprises (TE). All rights reserved.